If I am ever in Wales again, I will forage. But when I was sixteen and had just arrived in Wales, I remember being scratched and stung by stinging nettles that cover the hedgerow on the walk to Llantwit. I never imagined that these would be good to eat. But they are! They have a lot of protein and iron, and apparently other health properties, too. I've drunk nettle tea since I was pregnant with Eli, and I'm convinced that nettle tea (and rasberry leaf tea) really helped me during pregnancy and labour. So it was a bonus to discover stinging nettles at the Ecovillage while harvesting nasturtiums. With the protection of a plastic bag, I picked enough for a meal, while trying to convince the kids not to touch it (thankfully there were plenty of nasturtiums to distract them). I hope to get much more before the season is over. 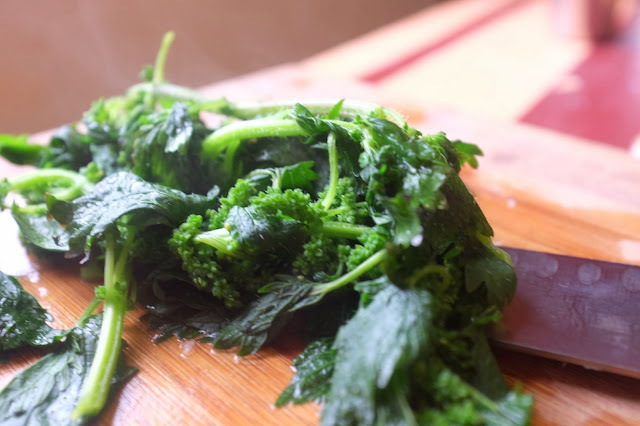 The experimental batch was easy to cook and had a very mild taste- milder and lighter than spinach. I brought to boil just enough water for them to be dipped in for a moment, and when I pulled them out they didn't sting. 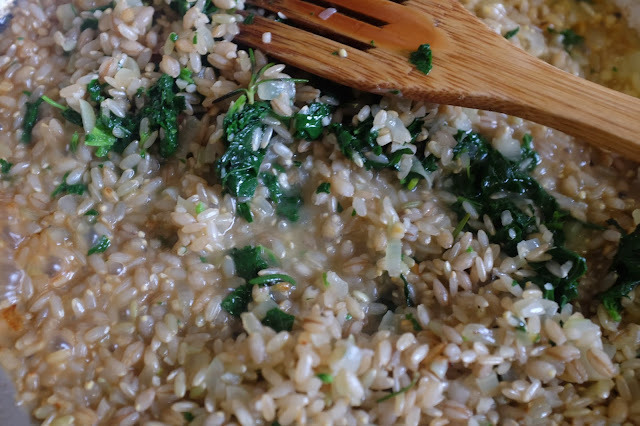 I used them in brown rice risotto- short grain brown rice and barley with beef broth, nettles and a little rosemary and South African parmesan. I say South African parmesan like it's something we always have in the house. We don't. But I got some for the nasturtium pesto and it's pretty lovely. Anyway, here's to free nutritious vegetables!